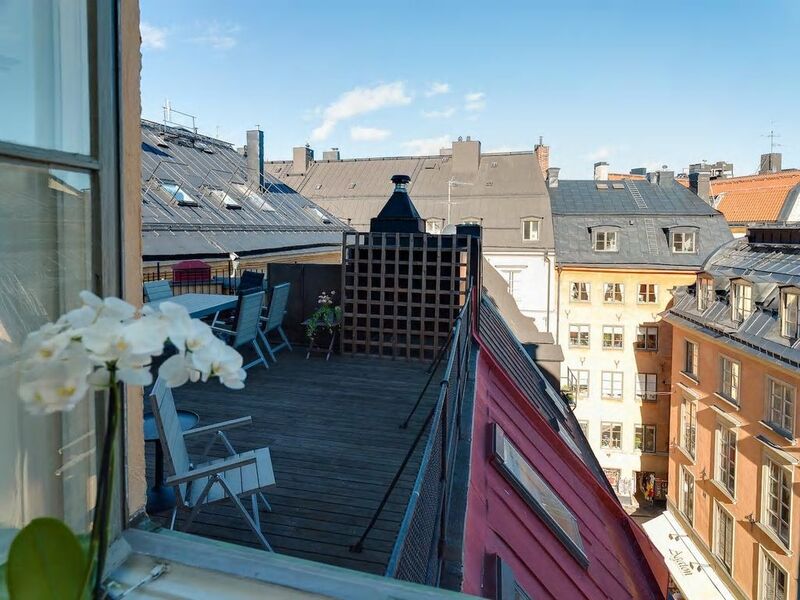 ONE BEDROOM APARTMENT WITH A TERRACE: Enchanting and large one bedroom apartment in the best location of Gamla Stan (Old Town) close to most sightseeing and with fine views over Old Town's ridges. The apartment is fully equipped with a double bed as well as a possibility to add one extra foldable bed (the comfort of the foldable bed is not ideal for long stays) in the living room. Private Terrace next to the apartment. A Great Pick for people looking for location! - 1 Bathroom(s) with shower, toilet, hair dryer. - TV, Satellite, 5th floor, lift, terrace, iron, internet (Wi-Fi), hair dryer, 45 m² property, central heating. "Gamla Stan" - Old Town is one of the largest and best preserved medieval city centres of Europe. Its also one of the foremost attractions in Stockholm and this is were Stockholm was founded in 1252. All of "Gamla Stan" and the adjacent island of Riddarholmen are like a living pedestrian-friendly museum full of sights, attractions, restaurants, cafes, bars and places to shop. Even now cellar vaults and frescoes from the middle age can be found behind the visible facades, and on snowy winter days, the district feels like something from a storybook. This is truly one of Stockholm's most beautiful areas! Please note! You have to pay the full rent at the same time the reservation is made and its a very strict cancellation policy. If it turns up some questions while you are in Stockholm, you can easily contact our staff on site. Obviously, they can also help with general questions such as where it is best to buy concert/theatre tickets, tips on good restaurants & shops as well as other experiences and attractions. It is safe to book through Classic Travel – we have rented out apartments in Stockholm since 1994. We have the highest rating on TripAdvisor! Please note we have more than 50 apartments for rent in Stockholm, we also rent out apartments in New York, Los Angeles, Amsterdam, London, Costa del Sol, Paris, Rome, and Thailand. Classic Travel was founded in 1994, the company is a privately owned tour operator who rents out furnished centrally located apartments in Paris, Rome, Stockholm, Amsterdam, Costa del Sol, Thailand, New York and Los Angeles from 1 night up to several years. Our customers range from private travelers to leading schools/universities and multinational companies. The company also arranges market-leading travel & tours to Thailand, Malaysia, Indonesia, Cambodia, Myanmar, Vietnam, Dubai, South Africa and Mauritius. Classic Travel is one of Sweden’s oldest tour operators and has made legal travel guarantees – all for your safety. Classic Travel has offices in Sweden, France, Spain, Thailand and the United States. Our business idea is to arrange trips to destinations that we love ourselves. With us, you get the best possible service in a slightly more familiar manner. Classic Travel is growing steadily and we have both a Swedish and international sales department. Great location in the middle of shopping and restaurants. Apt was very comfortable and clean. Would definitely recommend.